Amorite king of Bashan, who reigned in Ashtaroth and was conquered by Moses and Israel in the battle of Edrei (Num. xxi. 33), sixty fortified cities, with high walls, gates, and bars, comprising the region of Argob, being taken and given to the children of Machir, son of Manasseh (Deut. iii. 13; Josh. xiii. 31). Og was one of the giants of the remnant of the Rephaim. His iron bedstead in Rabbath, the capital of Ammon, is described as having been nine cubits in length and four cubits in breadth (Deut. iii. 11). Og was not destroyed at the time of the Flood (Niddah 61a), for, according to one legend, the waters reached only to his ankles (Midr. Peṭirat Mosheh, i. 128, in Jellinek, "B. H." ii.). Another tradition states that he fled to Palestine, where there was no flood (Rashi to Niddah, ad loc. ); while, according to a third legend, he sat on a rung of the ladder outside the ark, and, after he had sworn to be a slave to Noah and his children, received his food each day through a hole made in the side of the ark (Pirḳe R. El. ch. xxiii.). Og was known also as "Ha-Paliṭ" (see Gen. xiv. 13). It was Og who brought the news to Abraham of the captivity of Lot. This he did, however, with an evil motive, for he thought that Abraham would seek to release Lot and would be killed in battle with the great kings, and that he, Og, would be able to marry the beautiful Sarah (Gen. R. xlii. 12). A long lease of life was granted him as a reward for informing Abraham, but because of his sinister motive he was destined to be killed by the descendants of Abraham. Og was present at the banquet which Abraham gave on the day Isaac was weaned (comp. Gen. xxi. 8). 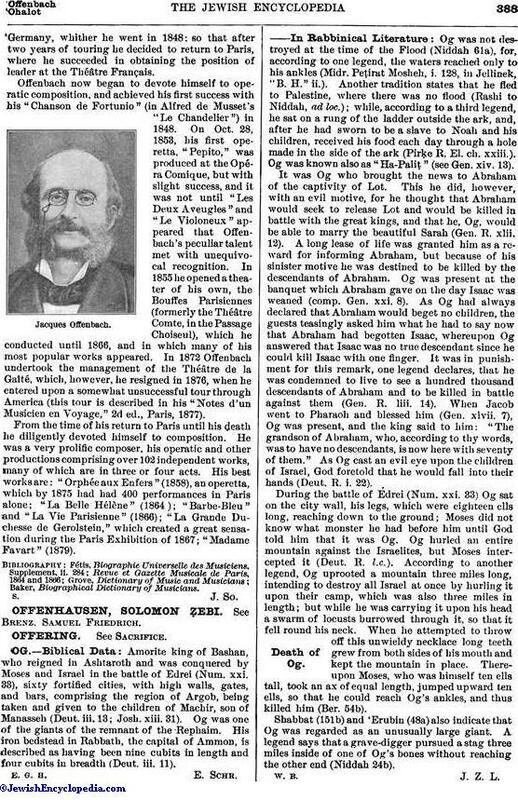 As Og had always declared that Abraham would beget no children, the guests teasingly asked him what he had to say now that Abraham had begotten Isaac, whereupon Og answered that Isaac was no true descendant since he could kill Isaac with one finger. It was in punishment for this remark, one legend declares, that he was condemned to live to see a hundred thousand descendants of Abraham and to be killed in battle against them. (Gen. R. liii. 14). When Jacob went to Pharaoh and blessed him (Gen. xlvii. 7), Og was present, and the king said to him: "The grandson of Abraham, who, according to thy words, was to have no descendants, is now here with seventy of them." As Og cast an evil eye upon the children of Israel, God foretold that he would fall into their hands (Deut. R. i. 22). During the battle of Edrei (Num. xxi. 33) Og sat on the city wall, his legs, which were eighteen ells long, reaching down to the ground; Moses did not know what monster he had before him until God told him that it was Og. Og hurled an entire mountain against the Israelites, but Moses intercepted it (Deut. R. l.c.). According to another legend, Og uprooted a mountain three miles long, intending to destroy all Israel at once by hurling it upon their camp, which was also three miles in length; but while he was carrying it upon his head a swarm of locusts burrowed through it, so that it fell round his neck. When he attempted to throw off this unwieldy necklace long teeth grew from both sides of his mouth and kept the mountain in place. Thereupon Moses, who was himself ten ells tall, took an ax of equal length, jumped upward ten ells, so that he could reach Og's ankles, and thus killed him (Ber. 54b). Shabbat (151b) and 'Erubin (48a) also indicate that Og was regarded as an unusually large giant. A legend says that a grave-digger pursued a stag three miles inside of one of Og's bones without reaching the other end (Niddah 24b).